Hello, I'm trying to add video on Emote pages , but it added only like a picture. What's happen? Oh great. So when you try to add it as normal, does it give any error? Regardless it's probably another wikia update thing that borked it. Hello Mechemik, I think it's broke again. 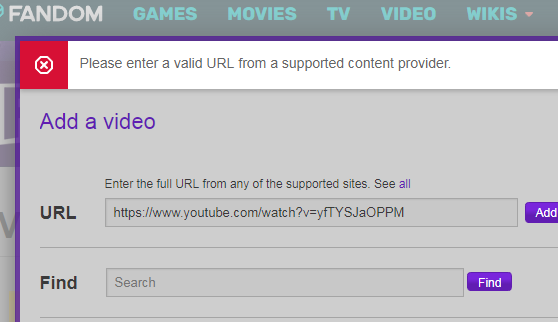 I can't add video from YouTube https://i.imgur.com/4tjWLeJ.png I hope you can fix it again. Regards! Sorry, I'm not really here much anymore, but maybe one of the others can help you out with it?